Add broccoli into your day today! Government guidelines recommend that adults eat more than 4 cups of fruits and veggies each day. A perfect vegetable choice is broccoli, which has been around for more than 2,000 years. 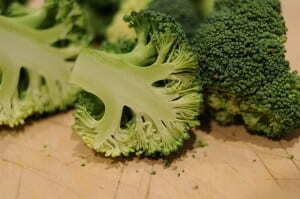 Broccoli has lutein and zeaxanthin, phytonutrients that preserve good vision and may prevent cataracts. In addition, it has many cancer-fighting compounds, including vitamin A (beta-carotene), vitamin C, and fiber, and may reduce the risk for colorectal cancer. Broccoli also contains folic acid, which helps decrease certain types of birth defects. Dip raw florets into a small amount of guacamole or low-fat dip. Add chopped fresh or frozen broccoli to soup for a hearty stew. Top baked potatoes with broccoli and a little low-fat cheese.